BOGO 50% off deal on One A Day, Flinstones, Airborne, L'il Critters, Nature's Bounty, and more products on pg 12. Get more of these deals for more products on the same part of the ad. 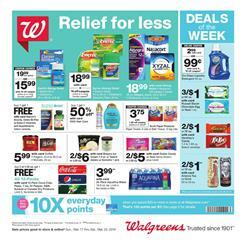 Walgreens brand items like Omeprazole, Mucus Relief, Ibuprofen, and flexible fabric are also available with a BOGO deal next week. Everything has a solution with a proper plan and necessary items that will be used to execute it. If you are sick of expensive prices of health-care products, give a visit to the Walgreens so that you can see all these products for the prices from the Walgreens Weekly Ad. Claritin is also on sale. You will be able to buy Claritin 24-hr. allergy relief for only $34.99. Your Medicare plan can give you additional savings. For example, save $5 with your Medicare Part D plan on your prescriptions. More than medicines are available in the health section of the store. If you need more protein than you normally eat, you might want to take some extra nutritional value from the nutritional shakes. Some of them are protein-rich and some are carbohydrates. People take them before and after exercising to build muscles and stay healthy. You will be able to buy some chemicals, cleaning products, and related products at a lower price with the Walgreens Weekly Ad Preview. Give makeup to your house, make it beautiful before Spring climate takes over the control. Enjoy the nice weather when you complete all the works for indoor areas of your home. Feel comfortable with the prices of Walgreens because they have a really good range. The ad is also useful for other categories shopping like Easter candies, snacks, beverages, breakfast foods, and more. One example of this sale is from the "deals of the week". Buy Tide simply detergent or Downy fabric softener for only $1.95 after an online coupon saving. Multiple-buy savings are also interesting deals. For example, you can buy 2 Nice! Paper products for $10 only. More deals are available on pg 3. Purex Laundry care, Xtra liquid laundry detergent are both good deals. Purex products are BOGO Free. This week, you have really good discounts. Go to the browsable Walgreens Ad to see all pages. Don't forget to see the Easter products on pg 6. Coupon Savings might be of great use when you want to lower the costs of the week. Subscribe to get emails about the posts and future Walgreens Ads. 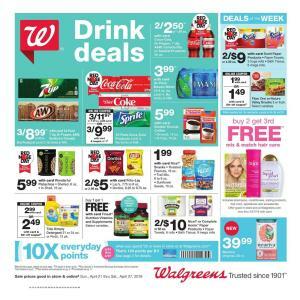 The preview of Walgreens Ad Mar 24 - 30, 2019 has a great Easter sale on pg 6. Buy a gift, stock some candies, enjoy the lower prices of the latest Walgreens Ad Preview. The prices will be effective starting on Sunday. Jewelry from $6.99, Easter accessories or toys from $.99 and more low-price deals of Easter category. $5 Register Rewards is a good deal as well. 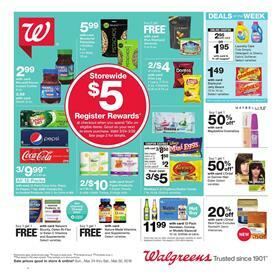 Spend $30 on eligible items to earn $5 rewards at Walgreens store. Snacks are on sale. A lot of great favorite snacks of popular brands, candy packs at low prices, and more will be in your inventory for a low price at Walgreens. Buy health-care, pharmacy products, and beauty products like hair colors on the second half part of the Walgreens Weekly Ads. In the Wphoto deals, you will find 25% - 50% discounts on some services like enlargement, canvas prints, stationery, and more. Also, know that some of the Easter products are exclusive items for such prices. You will find many more products in the Walgreens Ad Preview. Subscribe to this page to get emails of future in-ad discounts. Browse the entire weekly ad content to see all products. Earn $4 rewards for purchasing 4 Softsoap hand soap. $3 Register Rewards is for 3 purchases of Crest toothpaste. See more eligible products for winning rewards at Walgreens. 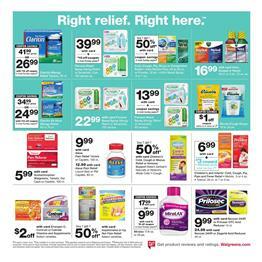 Cough, cold, allergy relievers, vitamins, supplements, and more products from the Walgreens Weekly Ad Pharmacy Deals Mar 17 - 23, 2019. You will find a lot of coupon savings in this ad. Miralax is one of the best ones of the coupons. Get your pain reliever at Walgreens for only $5.99 for 100 ct. pack. Walgreens offers $5 saving on Medicare Part D prescriptions. If you are planning to lose some fat before building some muscles, you definitely need to boost your protein intake. It's a lot of effort to get proteins from the foods. Human body starts to consume stored fat after it's out of carbohydrate. For example, if you need 2500 kcal for daily activities of your body, you need to eat around 1800 kcal to lose approx. 1 pound every week. But your body might start to eat your muscles. In order to stop that a bit, you need to get protein shakes. Nutritional shakes are also very quick breakfasts. Nutritional shakes, ensure original or clear protein, and more are available on pg 12. Follow the Facebook page for more like these deals. Get the newsletter by a subscription for free. Household products such as laundry detergents, bathroom tissue, air fresheners, and more are on sale. 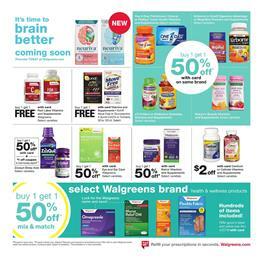 See these products on the first pages of Walgreens Weekly Ad Mar 17 - 23, 2019. Online coupon savings on so many products are available through this ad. For example, Scott Paper products will be only $3.75 with $1.25 off coupon saving. Deals of the week are Oxi clean laundry detergent, Russell Stover chocolate egg, Hershey's candy, and Arizona tea. Buy Purex liquid laundry detergent for only $5.99 at Walgreens stores. Promotions of the deals on snacks and beverage including 2L Pepsi, Antioxidant tea, and more favorites can be your options for shopping in this week at Walgreens. Also, browse the multiple-buy deals like Voss Artesian still water priced at 2 for $2. If buy 2 Lindt Ghirardelli or Godiva, they will only cost $5. Simple Orange juice is also a multiple sales which is $7 for 2. Stock your favorite products from the snack shelf of the Walgreens Ad. Beverages like Pepsi bottles, Gatorade are on sale. Buy more and save more. 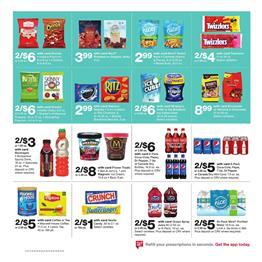 Early Easter snacks are also available in this part of the weekly ad. Shop Godiva Easter bunny, stuffed animals, and Wubbie toys on pg 6. You can save with these prices even though it might be early for Easter shopping. Don't forget to see this part of the sale.